KABUL -- The Terrorist Financing Targeting Centre (TFTC), a seven-nation collaborative body established to confront terrorism financing, recently sanctioned nine individuals accused of providing financial, logistics or military support to the Taliban. All TFTC members -- the United States, Saudi Arabia, Bahrain, Kuwait, Oman, Qatar and the UAE -- jointly designated these key Taliban members and their Iranian state sponsors. The nine individuals include seven Taliban leaders or sponsors and two members of Iran's Islamic Revolutionary Guard Corps (IRGC). "[These individuals] seek to undermine the security of the Afghan government," the US Treasury Department said in a statement October 23. 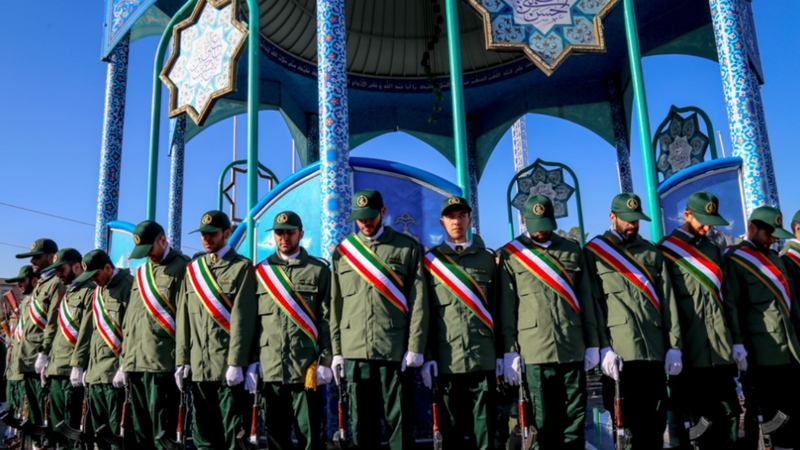 The two Iranian officials sanctioned belong to the elite Quds Force, a special forces unit of the IRGC that provided support to the Taliban, the statement said. "Iran's provision of military training, financing and weapons to the Taliban is yet another example of Tehran's blatant regional meddling and support for terrorism," US Treasury Secretary Steven Mnuchin said in the statement. "The United States and our partners will not tolerate the Iranian regime exploiting Afghanistan to further their destabilising behaviour." The statement added that the TFTC will "continue to actively target those providing financial support to the Taliban until there is a negotiated peace settlement [in Afghanistan]". Iran has long been accused of providing material and financial support to the Taliban militants in Afghanistan. Although senior Afghan officials do not often publicly acknowledge Tehran's malicious support, Afghan security forces have on multiple occasions seized Iranian-made weapons on the battlefield from the Taliban. "We welcome pressures and sanctions on the Taliban and all other terrorist groups," Sebghatullah Ahmadi, a spokesman for the Afghan Foreign Ministry, told Salaam Times. "We support any action that will help us to achieve peace." "We need to put pressure on the terrorist groups so that we can realise peace," he said. "Iran has destructive projects in Afghanistan," Abdul Qadir Kamel, a Herat-based political analyst, told Salaam Times. "Iran views the western parts of Afghanistan as a strategic area and tries to [impose] its political, cultural, economic and military influence on the region." "The sanctions imposed by the United States and some Arab countries on Mullah Samad are based on evidence," said Jilani Farhad, spokesman for the Herat provincial governor, referring to one of the sanctioned Taliban leaders. "We have always maintained that the Taliban could not resist Afghan forces for a single day in Herat if they weren't receiving support from a foreign country," he told Salaam Times. In 2017, Mohammad Ebrahim Owhadi, an IRGC Quds Force officer, reached an agreement with the Taliban deputy shadow governor of Herat Province, Abdullah Samad Faroqi, also known as Mullah Samad. Under the deal, the Quds Force provides military and financial assistance in return for Mullah Samad's forces attacking the Afghan government in Herat Province, according to the statement. The agreement includes training for Mullah Samad's militants at Quds Force training facilities near Birjand, Iran. Esmail Razavi was in charge of the training centre at the Quds Force base in Birjand, which as of 2014, provided training, intelligence and weapons to Taliban militants in Farah, Ghor, Badghis and Helmand provinces. In 2017, Razavi travelled to Farah Province, where he encouraged the Taliban to conduct attacks in the border region of Afghanistan. In addition, he ordered a Taliban commander to disrupt construction of a dam in western Afghanistan. The Iranian regime also has displayed hostility towards Afghan water projects. Last August, Iranian Foreign Minister Javad Zarif warned that Tehran would use all available forms of leverage to obtain a free flow of water from Afghanistan, particularly from the Helmand River. As the Taliban's deputy shadow governor of Herat, Mullah Samad is one of several Taliban officials who maintain a close relationship with IRGC and Quds Force officials based in Birjand. He has accepted weapons and military aid from Iran for the Taliban. As of early 2018, Mullah Samad received thousands of kilogrammes of explosives from the IRGC that he planned to distribute to Taliban commanders in Herat. He visited a training camp in Birjand, where the IRGC was training Taliban fighters to attack a proposed pipeline that would run through Afghanistan. In February, a group of Taliban militants trained and funded by Iran surrendered to local authorities before carrying out their mission to attack the inauguration ceremony for the Turkmenistan-Afghanistan-Pakistan-India (TAPI) natural gas pipeline. In April, a second group of Taliban militants disobeyed Iranian orders to attack the TAPI pipeline and instead surrendered their weapons and joined the Afghan-led peace process. Mohammad Daoud Muzzamil served as the Taliban's deputy shadow governor of Helmand Province until his appointment in late 2017 as the shadow governor of Farah Province. In early 2017, Daoud was appointed leader of the Taliban's Quetta Shura Military Commission. He was sanctioned for "acting for or on behalf of the Taliban". As the Taliban's shadow governor of Helmand, Abdul Rahim Manan is designated for supplying "a large number of Taliban fighters to attack Afghan government forces". In late 2007, Rahim oversaw the logistics of lethal aid transfers from the IRGC and Quds Force to the Taliban. As of early 2018, he has been responsible for co-ordinating and organising Taliban operations in Afghanistan and continues to maintain ties with the IRGC. As of late 2017, Naim Barich was the Taliban shadow foreign minister and managed the group's relations with Iran. Barich was designated by the US government's Office of Foreign Assets Control (OFAC) on November 15, 2012, pursuant to the Kingpin Act (a US anti-drug trafficking law), for the significant role he plays in international narcotics trafficking. He also appears on the United Nations Security Council Resolution 1988 Sanctions List because of his support for the Taliban. Abdul Aziz, who is based in Pakistan, is designated for various narcotics and illicit mining activities used to fund the Taliban. As of early 2017, Aziz arranged for two drug shipments belonging to Taliban commanders to be transported out of Afghanistan to Europe and Africa using Pakistani and Iranian routes. In exchange, the Taliban provided protection for one of Aziz's narcotics processing facilities in Helmand. He also has served as a middleman for the sale of opium from Afghan farmers to the Iranian and Turkish narcotics traffickers. Aziz provides funds to the Taliban's Quetta Shura every year and collects money from other international drug dealers in the Gulf for the purpose. Previously, Aziz smuggled gemstones from Afghanistan for international sale and donated a large portion of the proceeds to senior Taliban leadership in Pakistan. Similarly, in 2017, Aziz planned to set up a marble quarrying venture in Pakistan and to bring a collection of green, white and pink onyx with him when he travelled to the UAE. Sadr Ibrahim has led the Taliban's Military Commission for four years. He previously served on the Taliban's Peshawar Military Commission and as a Defence Ministry official during the Taliban's regime in Afghanistan (1996-2001). In 2018, Iranian officials agreed to provide Ibrahim with monetary support and individualised training in order to prevent a possible tracing back to Iran. As a senior member of the Taliban Shura and Military Commission member, Hafiz Majid oversees all suicide attacks in Afghanistan. He was an adviser to the Taliban's founding leader, Mullah Mohammad Omar (now deceased). During the Taliban regime of 1996-2001, Majid was the Taliban's security chief of Kandahar Province. Pakistan's dirty army fire mortar shells at the Nolay and warghalay areas of Sarkano District of Kunar province; however, so far Afghan government has not shown any reaction to this shelling and this have forced residents to flee the area, so we want the government to show reaction to this action, else, the area will come under the control of Pakistani government. I defecate in the mouths of bloodthirsty, filthy, terrorist Iranians! I hope they annihilate! Unfortunately your report is not documented and is written based on some delusions. I hope Afghanistan will rebuild again. It is better if you publish these reports in local media as well, so that our people better recognize their enemies. Situation: Based on the intelligence assessments, ground operations and air strikes have caused heavy casualties and weakening of the enemy's morale in carrying out their attacks on central security forces in districts and provinces. Moreover, enemy's attacks have decreased when compared to a few months ago. This reflects the precise, coherent planning and coordination among the country's security and defense institutions. In the upcoming winter, a number of enemy forces will leave the cold regions for the warmer regions inside the country [Afghanistan] or they will move to Pakistan and Iran, where they will seek a safe haven, while others may join the peace process. However, most of the enemy's activities will be concentrated on provinces located in the eastern and southwestern zones in order to control the passage and infiltration along the Durand line. The enemy is trying to attract people to their forces in a number of provinces, and dispatch them beyond the Durand line to undergo training and preparation for next solar Hijri year 1398 , as well as to acquire weapons and ammunition. They do so in order to preserve areas under their control, especially in those districts that have already been fallen. 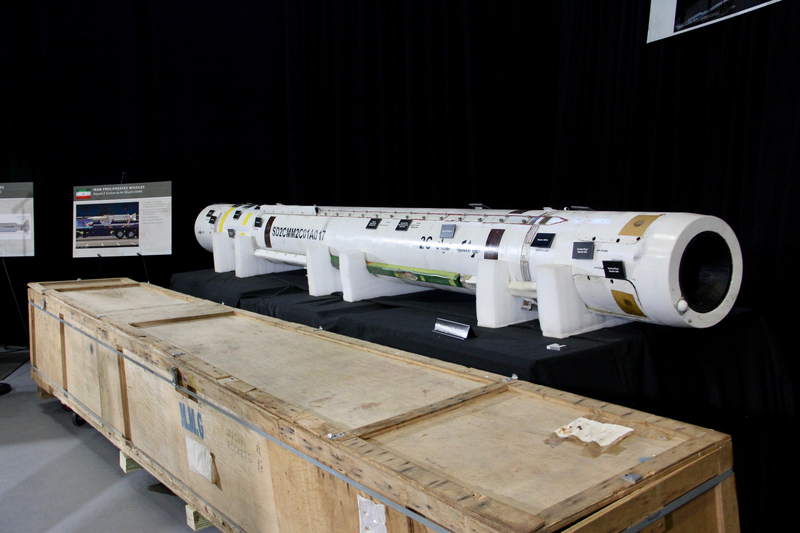 US officials displayed a collection of weapons that Iran supplies to militant groups in Afghanistan and across the Middle East, including anti-tank guided missiles provided to the Taliban.